I had approached my lender to resolve a dispute on my Experian Credit Information Report but the bank has asked me to approach Experian Credit Information Company of India directly. The data in the Experian Credit Information Report is based on the information provided to us by all our member banks, financial institutions and other credit grantors, therefore the concerned credit granting organisations own the data in your credit information report. We are not authorised to amend or change any data without the specific written consent of the lender who provided the information to us. It may be that the lender has therefore referred you to us in error, so we’d be happy to assist you in dealing with the lender to ensure that any queries, errors or misunderstandings are quickly resolved. Experian Credit Information Company of India Pvt. Ltd., Consumer and Customer Support Team, Equinox Business Park, Tower 3, 5th Floor, East Wing, LBS Marg, Kurla (West), Mumbai, 400070. Why can’t you resolve my dispute over the phone, why can’t you correct my data immediately? The data in the Experian Credit Information Report is based on the information provided to us by all our member banks, financial institutions and other credit grantors, therefore the concerned credit granting organisations own the data in your credit information report. We are not authorised to amend or change any data without the specific written consent of the lender who provided the information to us. We do understand that you would want to conclude matters quickly and so are very happy to assist you in dealing with the lender to ensure that any queries, errors or misunderstandings are quickly resolved. I don’t agree with something in my report – how can I get this amended? Whenever I have any query regarding my credit report…I’m being asked my ERN number, what is it? Your Experian Report Number (ERN) is a 15 digit number recorded at the top right hand side corner of the Experian Credit Information Report. It is essential that the ERN is mentioned in all communications with us, as without it we would be unable to assist you. If you have lost or destroyed your Experian Credit Information Report, you would need to order another report, with a fresh ERN before we would be able to assist with any queries you may have. This is important, to ensure that we are only discussing the information contained within the report with the person to whom it relates. 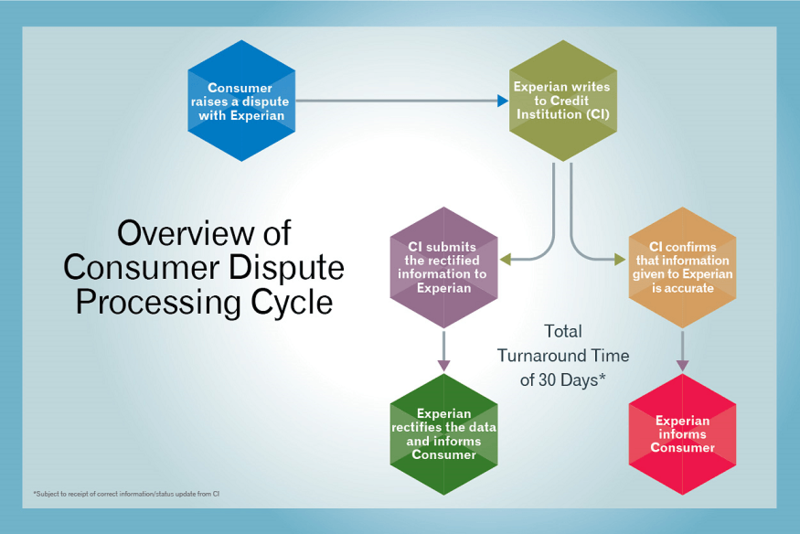 The objective of this Consumer Complaint Redressal Policy is to provide a detailed guideline which will help consumers to approach Experian Credit Information Company of India Private Limited (“ECICI”) with any query, request or dispute related to their Credit Information report and ensure timely and effective resolution of the same. To be compliant with the RBI Regulations and Guidelines and all Credit Bureau relevant regulations primarily including the Credit Information Companies Regulation Act of 2005 read with the Rules and Regulations of 2006. To ensure consumer satisfaction and adherence to service levels. Post – Letters can be sent to Experian Credit Information Company of India Pvt. Ltd., Consumer and Customer Support Team, Equinox Business Park, Tower 3, 5th Floor, East Wing, LBS Marg, Kurla (West), Mumbai, 400070. Consumer may call or email ECICI regarding any queries or concerns about their Credit Information Report / Score. ECICI Consumer Support team will answer the Consumer query by responding to the Consumer via call or email depending on the nature of the query. If the Consumer has called or emailed related to a discrepancy in his/her Credit Information report, then he/she will be requested to provide his unique Experian Report Number (ERN) which was assigned to his report and highlight the nature of the dispute. Any Credit report dispute reported by the Consumer to ECICI Consumer Operations will be intimated to the respective lender/bank/member Credit Institution within 7 days of receipt of such dispute. Disputes pertaining to discrepancy of Credit Information will be resolved within 30 days subject to receipt of the responses from the respective lender/bank/member Credit Institution and the Consumer will be informed of the response and the rectification (if any) by email/phone/post as applicable. A detailed report of complaints along with Root Cause Analysis findings and action taken would be shared with the Consumer Protection Committee (CPC) reporting to the ECICI Board of Directors on a quarterly basis. ECICI shall provide a written acknowledgment to the consumer notifying them that their complaint has been noted and is in the process of being addressed and/or resolved. The acknowledgement will be sent within 24 working hours / by the next business day. Action on the Complaint will be initiated within 3 business days from the date of receipt. Complaints pertaining to rectification of credit information will be resolved within 30 days subject to receipt of responses from Banks / Credit Institutions. All other types of complaints will be resolved in 10 business days. Reporting routines will be established to provide insight regarding complaint triggers and enables analysis by the business and governance team that supports on-going root cause analysis and remediation efforts. The Consumer may use the following escalation grid to convey any grievance during or after the dispute handling process. Noted deficiencies will be escalated to the appropriate business unit and/or personnel in accordance with escalation processes established by the business. Issues will be escalated to Compliance and Legal, as appropriate. The process defined in this document is indicative basis the regulatory guidelines and subject to change on a case to case basis. ECICI reserves the right to alter and / or delete any steps or clause/s or change this document in entirety through a review, without prior intimation. This Policy will be reviewed once in 18 months. Any dispute shall be subject to the jurisdiction of the courts in Mumbai only. ECICI reserves the right to review & revise its policies and processes without intimation.